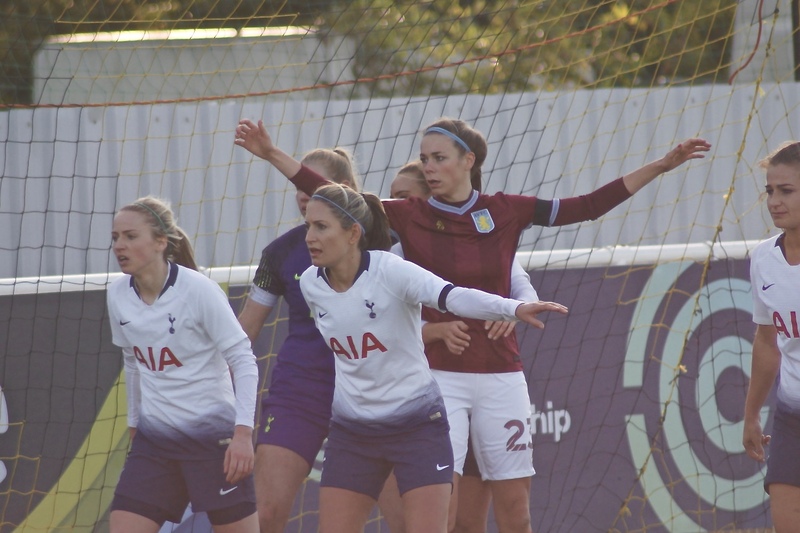 An away trip to unbeaten Tottenham Hotspur on a fresh Sunday morning was always going to be a hard trip for Aston Villa Ladies, but as we built and gelled as the season goes on we were up for the challenge in a season that saw our last two games us be unbeaten with two draws. After being told there were no programmes for the game and a drink in a very dark bar we made our way round for the game to start. It was great to see Jodie and Wayne at the game as we made our way round before kick off. The game kicked off and Villa came out the blocks fast as the last few games and Nadine Hanssen really put the pressure on the Tottenham players as on the 7th minute the pressure built as the goalkeeper for Tottenham made an absolute clanger as she fed the ball straight to Kerri Welsh who didn’t need a second chance as she hit the ball into the back of the net making it 0-1 to Villa and the celebration that truly was something special as all the girls surrounded Jodie Hutton and gave her a huge hug as they celebrated, one team that has everyone’s back and live and play for each other. 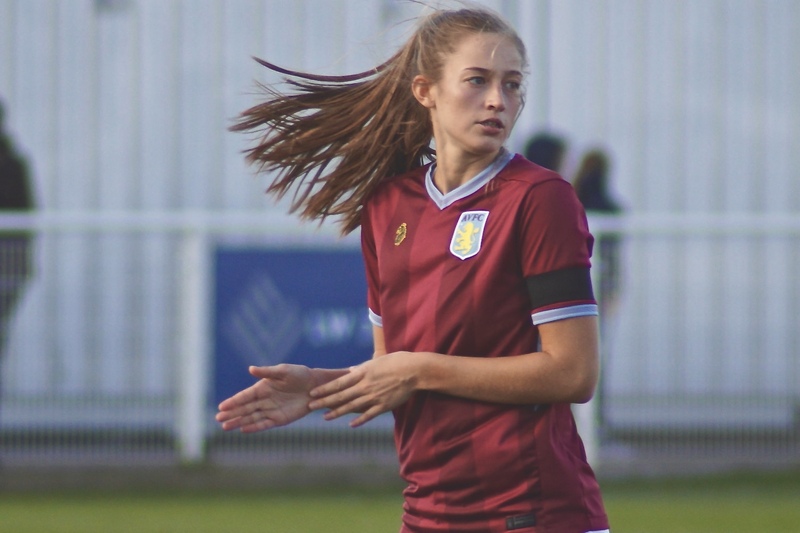 Some of the Villa build-up play was a joy to watch as Alice Hassall was at the centre of a lot of the play winning the ball back and spreading it out to the wings. A midfield battle took over as neither team could really make possession count and it was 20 minutes on the clock before Tottenham had a real chance that came from a free kick. 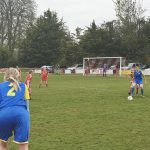 But once again as in a lot of games Sian Rogers pulled off a smart save to get down low as the free kick was hit towards goal keeping the score at 0-1 to Villa. The two teams battled it out but couldn’t quite get the ball to run through to the attackers as the defences were standing tall, Asmita Ale, Jade Richards, Elisha N’Dow and Hollie Gibson all working hard to make sure Tottenham couldn’t get anything in front of goal. Without a lot to choose between the two teams it looked as if Villa were going to take a deserved lead into the break, but as before a set piece cost us as a corner came in on the 41st minute that saw ex Coventry player Ashleigh Neville rise to head the ball into the corner leaving the score even as the teams went in for half-time break. 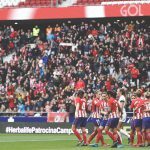 As the players warmed up and the teams came out it was time for a big second half as we played an unbeaten team who were topping the table in a game most people would have expected to be over by half-time, but we don’t play like that as the whistle went. Amy West had the first chance of the second half as she hit a shot that just didn’t have enough on it to cause real trouble but a warning again to show we wasn’t playing around. 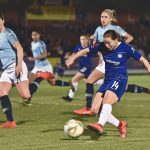 This seemed to wake Tottenham up as on the 50th minute Sian Rogers was called into action again diving low to save the ball keeping the scoreline at a deadlock. Foul after foul wasn’t called by the referee but when one finally was given a cheeky little set piece saw Amy West play the ball and get it back before sliding Kerri Welsh in as she just shot wide after some innovative play. 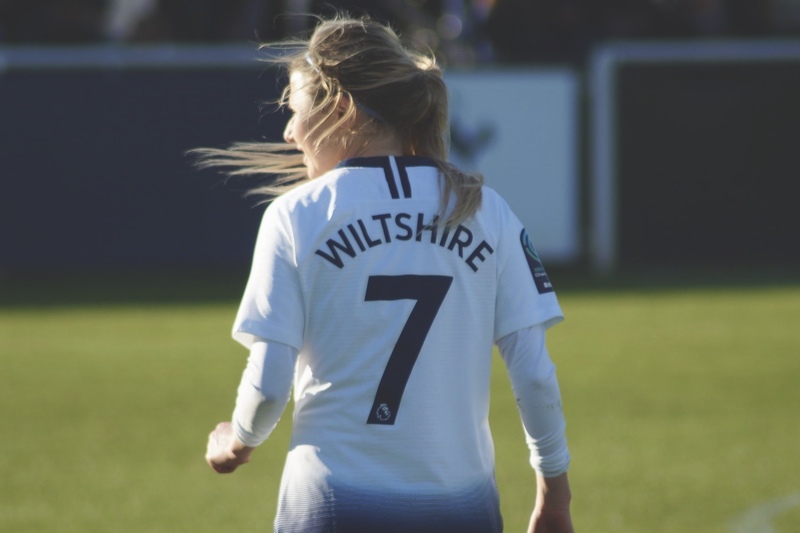 Phoebe Warner replaced Sophie Haywood on the 57th minute after putting a shift in and after being constantly caught by the Tottenham defenders. Followed by Tanisha Smith coming on for Kerri Welsh on the 66th minute, Kerri had given her all on the pitch as always adding a goal and holding the ball up so well. 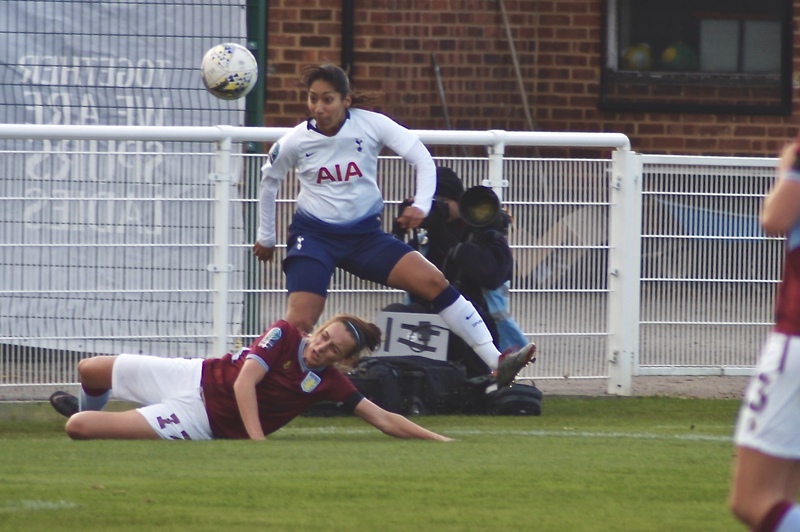 Tottenham were starting to cause Villa some troubles as it entered the last ten minutes including a ball that was hit into the box that saw Jade Richards connect with a diving header to clear the ball away from trouble. 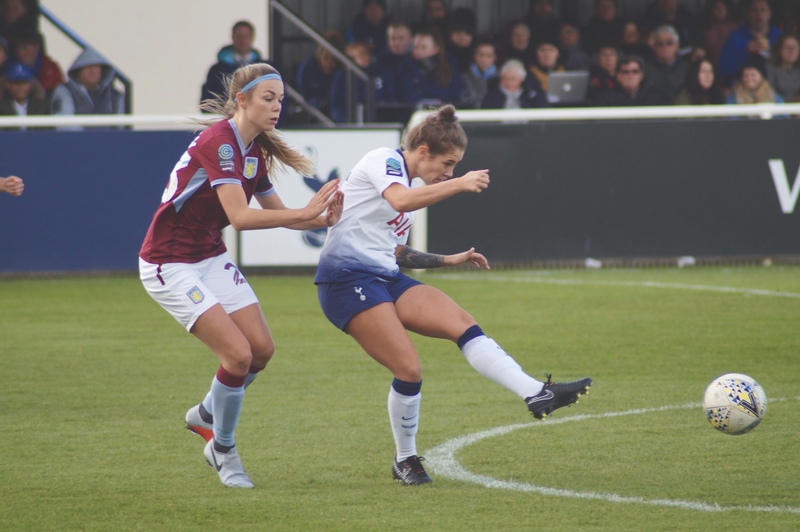 Angela Addison won a penalty for Spurs in the 82nd minute after her effort in the box was deemed to be handled by Nadine Hanssen. Rianna Dean stepped up to score her eighth league goal of the season as she slotted the spot kick past Sian Rogers to put Spurs ahead. Spurs didn’t deserve to be winning and Villa were unlucky to be losing. But as this season Villa heads didn’t drop. They jumped straight back on it and tried to get the goal back to make it 2-2. As we attacked and pushed forward Tottenham nearly made it 3-1 as Dean came close as she smashed it across the box and it went wider and wider. In the dying minutes of the game the ball was lofted into the box as it scrambled around the ball was smashed into the back of the net only to be called offside?! by a player who headed the ball off the line to clear the ball?! 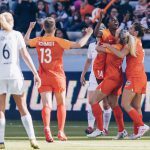 who was stood behind Nadine Hanssen as the ball came into the box that fell to Asmita Ale who was given offside which makes no sense unless she was standing off the pitch which means the ball was out of play. Also how the linesman could have seen this was truly incredible with the sun shining down on the box across his vision, but I guess those are the breaks a soft penalty and a disallowed goal saw us leave with nothing…. Or did it??? Now we didn’t win, we didn’t draw but I truly believe we left with something even more valuable, self-confidence that we came to a team that was unbeaten, that was top of the table and we pushed them right up till the end as a game of two decisions meant we didn’t leave with any points. 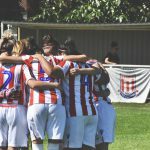 Our 4th penalty awarded against us in 6 league games have really made a difference but without a set piece or a penalty we haven’t conceded a goal in 3 games which have seen us make our way off the bottom of the table but not only in stats but in the play we have been putting together on the pitch. The team spirit you can see on and off the pitch is truly something proud to get behind week in, week out no matter what the result is. I’ve said to some people lately that for me Villa is a family to me and no matter what happens in the week it is always truly an honour to escape reality and get behind the team that makes me have a claret and blue heart. Where would I rather be on a Sunday afternoon…. Nowhere. Our new signings are fitting in so well and each and every player is pushing every other player, our coaching staff have the passion and drive that we also have on the sidelines to want to win and push this club as much as possible. One last thing is the parents who always are so thankful and welcoming to us at games which truly means a lot and is always part of the extended Villa family. 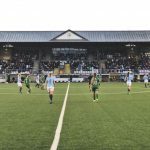 We are back at home next week… Imagine that, a lot of away games have already come in such a short space but we play against Millwall at Boldemere on the 4th November with a 3 pm kick off. 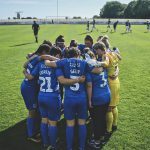 As I write this on a Sunday night I already can’t wait for Sunday afternoon to get behind our girls in the Claret and Blue once again. 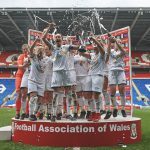 Spurs Ladies: Emma Gibbon, Jenna Schillaci, Ashleigh Neville, Lucia Leon (Megan Wynne 45), Renée Hector, Josie Green, Coral Haines (Sophie Mclean 62), Jessica Naz, Angela Addison, Rianna Dean, Bianca Baptiste (Sarah Wiltshire 71). Substitutes (not used): Chloe Morgan, Anne Meiwald, Wendy Martin, Ryah Vyse. 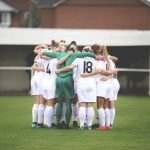 Aston Villa Ladies: Sian Roger, Asmita Ale, Elisha N’Dow, Jade Richards, Hollie Gibson, Alice Hassall, Nadine Hanssen, Amy West, Alison Hall, Kerri Welsh (Tanisha Smith 66), Sophie Haywood (Phoebe Warner 56). Substitutes (not used): Asa Aguirre, Evie Gane, Ria Elsmore, Natasha Baptise, Ashlee Brown.